On the 25th of July 1799, the French would engage the Turks at Abukir. 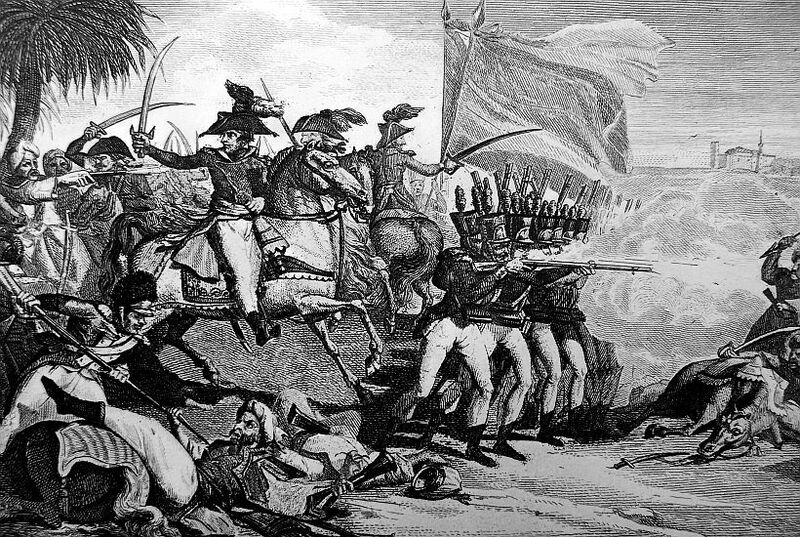 Around 18,000 Turks positioned themselves at a fort, with help from the British. 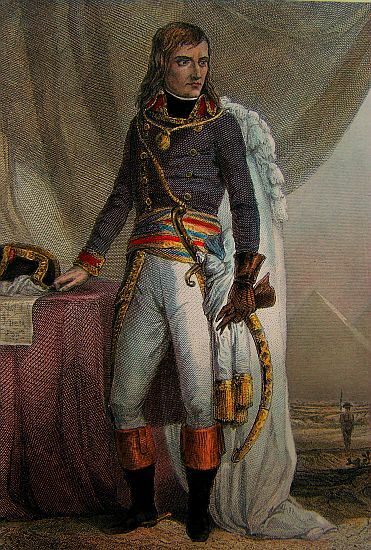 Once learning of the situation Bonaparte readied his army and marched out of Cairo. 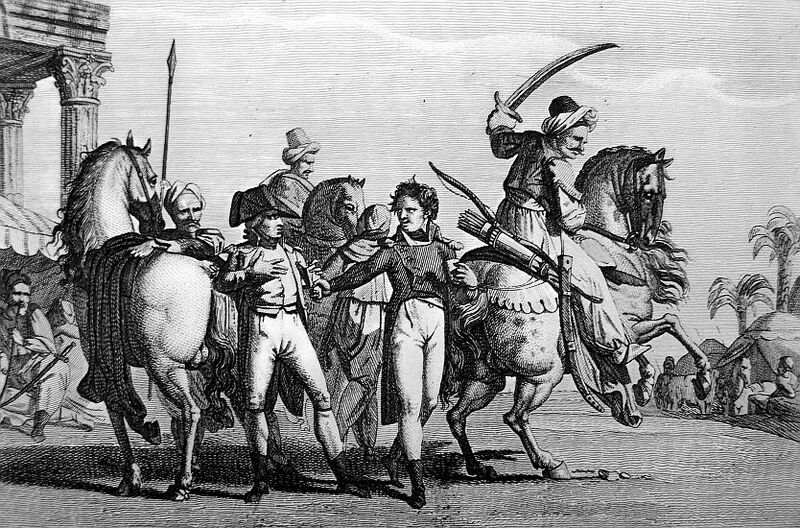 When Bonaparte arrived he went on the attack. 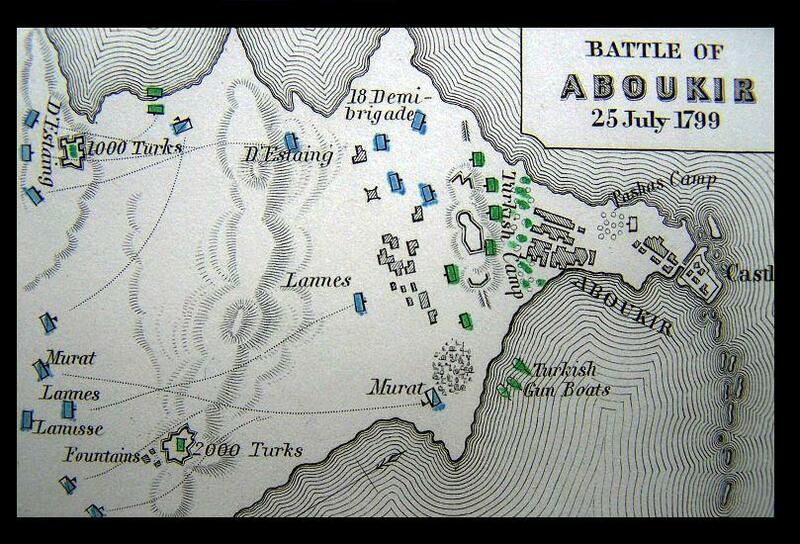 On the first day of fighting, Murat and his cavalry would win the days action outside the fort. 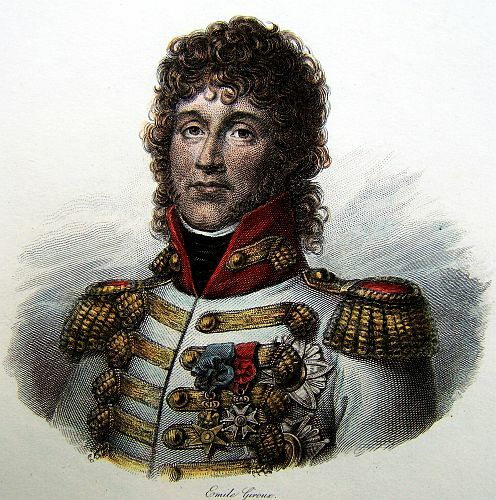 Although Lannes fought well, it would be Murat who would receive Bonaparte’s admiration. However, Murat would not be able to bask in his glory because he got a musket ball to the jaw. 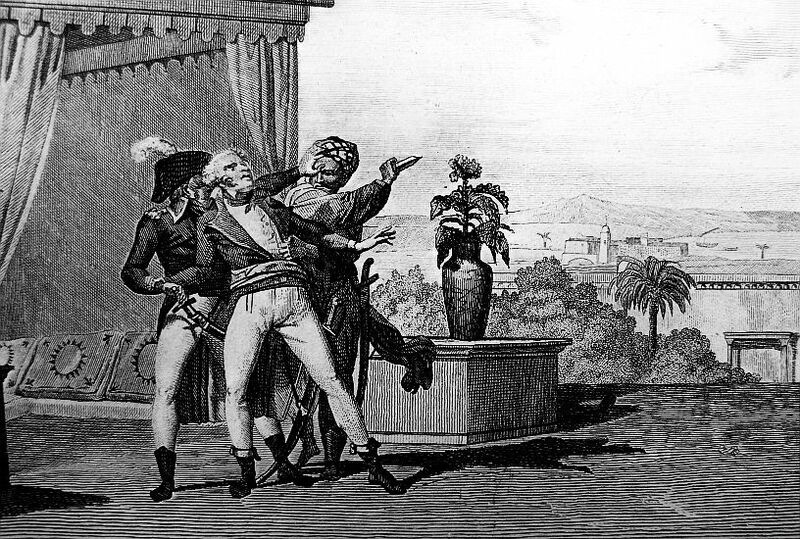 Murat would be sent to the hospital in Alexandria, while Lannes prepared to storm the fort where the Turks had retreated. With the siege of Acre probably still in his thoughts he opted for a straight forward attack. 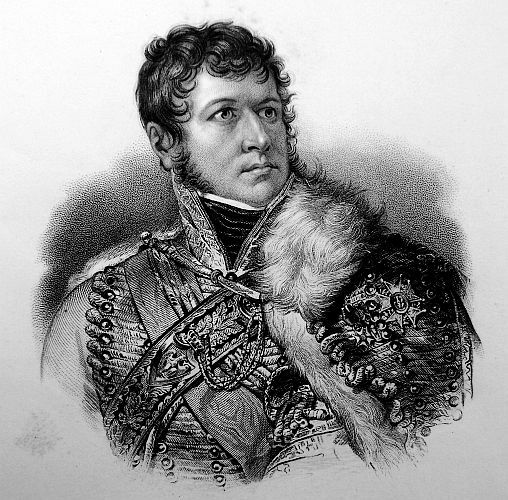 Lannes fought the Turks in a brutal house to house fight. During the attack, Lannes was shot in the leg and had to be taken to the hospital in Alexandria. Lannes would pass the time in the hospital by agitating a mute Murat. As for the battle it ending with an overwhelming victory for the French. The Battle at Abukir would be the last for Lannes during the Egyptian Campaign. 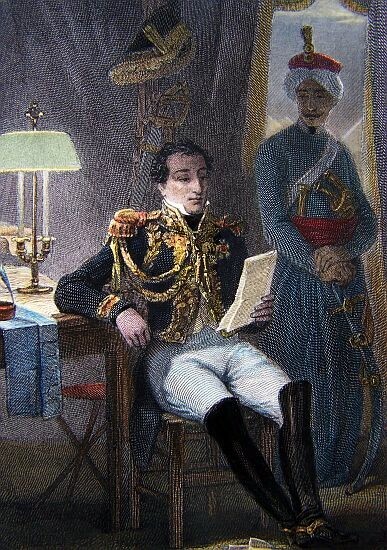 Egypt had lost its lure and upon hearing of French defeats in Europe, Bonaparte planned his return to France. 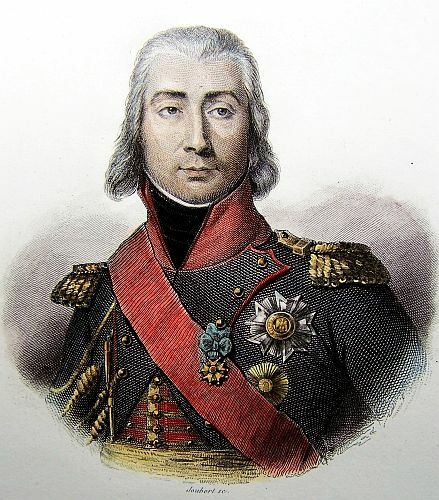 He would also take just a handful of loyal men including Androessy, Beauharnais, Berthier, Duroc, Lannes, Marmont Murat and leave the competition behind. 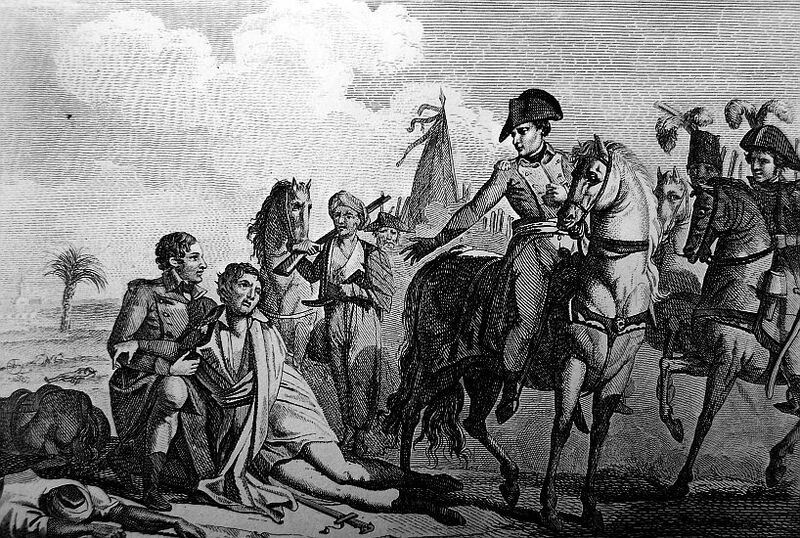 Bonaparte would not announce his departure to his faithful troops. 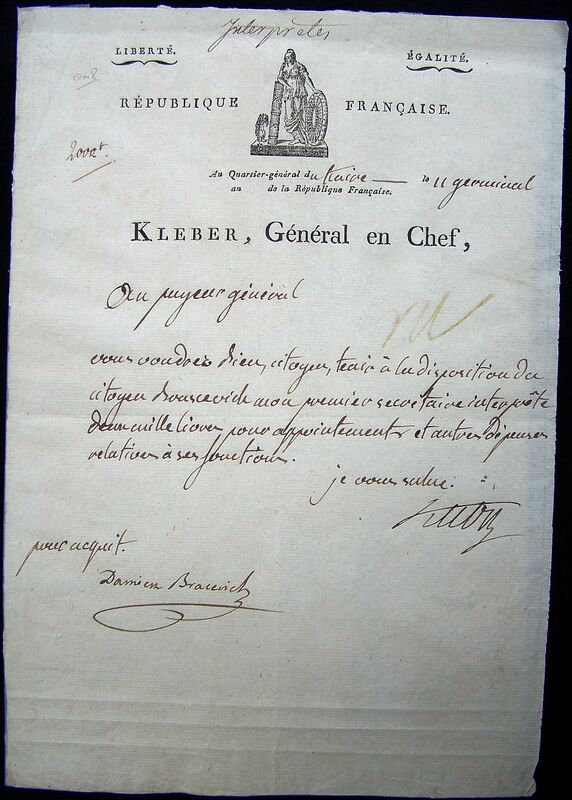 He would break the news to the new commander of the Army of the Orient Kleber with a letter. On the 22nd of August 1799, Bonaparte and his selected few boarded a ship and sailed for France. The remaining french would not see their homes for two years, while many others would not live long enough to go home. 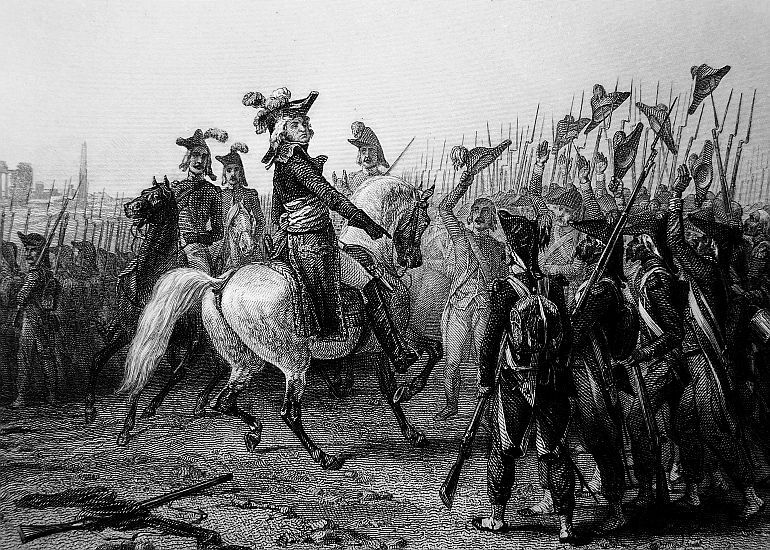 After the departure of Bonaparte, the army would be left on it’s own to survive. 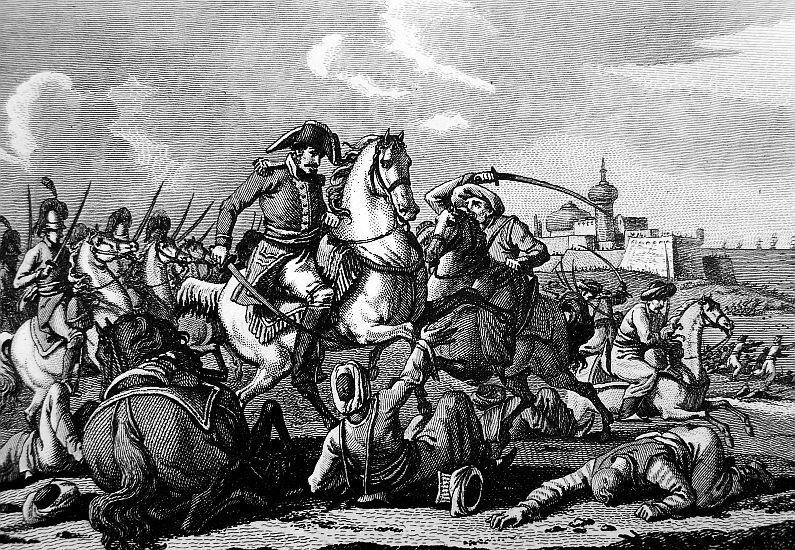 In March of 1800, Kleber engaged 30,000 Mameluks at the Battle of Heliopolis. The French won the battle and it would be the last victory for Kleber. With in a few months Kleber was assassinated in Cairo and Menou would take the reins. 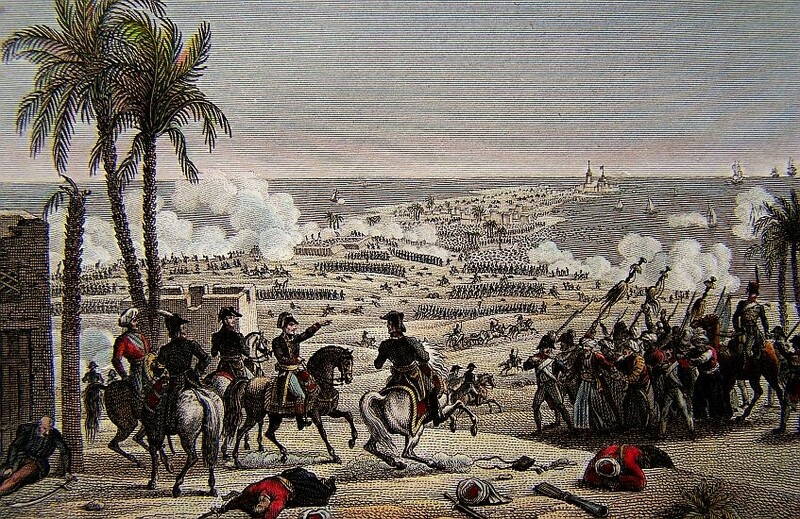 British forces soon landed at Alexandria and after several months of fighting, Menou capitulated to the English on the 31st of August 1801. In the terms of the surrender the remaining French were allowed to leave Egypt for France. The following Message from the Directory to the Council was read: We hasten to transmit to you the copy of a dispatch which the Executive Directory has this instant received from General BUONAPARTE. [The shout of 'Long live the Republic!' resounded in every part of the Hall.] You will find in it that the gallant army of the East, and its Commander in Chief, have not ceased to shew themselves worthy of the cause which they defend. 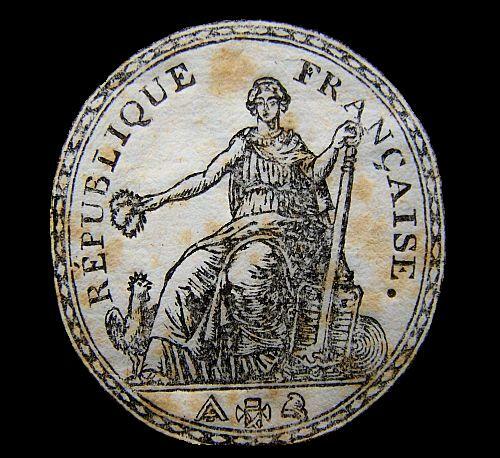 It has also received some details respecting the actions which took place on the 3d and 4th Vendemiaire in Helvetia. The result is, that in those two engagements, the enemy has lost 8,200 men killed, 5,000 in prisoners, and has had 6,500 wounded. His total loss amounts to 19,700 men. We have also taken 6 standards, 150 pieces of cannon, and all the baggage. “I stated to you in my dispatch of the 21st Floreal, that the season for embarking had determined me to leave Syria, and the embarkation accordingly took place on the 23d Messidor. One hundred sail, several of which were ships of war, appeared before Alexandria, and came to anchor at Aboukir. On the 27th, the enemy effected a landing, took by assault, with uncommon intrepidity, the redoubt and fortress of Aboukir, and, having landed his artillery, being further reinforced buy 50 sail, occupied a position supported on his right by the sea, with his left to the Lake Maadie, situated on very advantageous hills. I left my camp at the Pyramids on the 27th, arrived on the 1st Thermidor at Rahmanie, and marched to Birkat, which became the centre of my operations, whence I proceeded against the enemy on the 7th Thermidor, at 6 o’clock in the morning. General MURAT, who commanded the vanguard, ordered the right of the enemy to be attacked by General DESTAING. 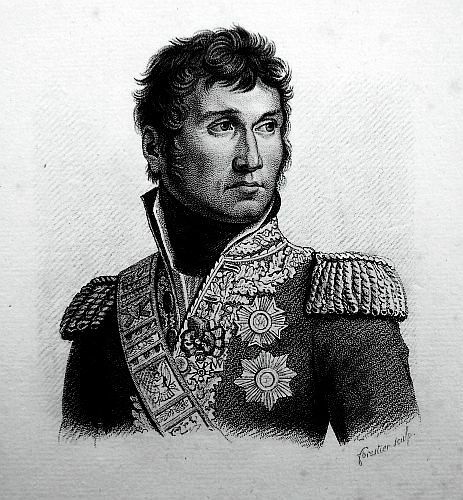 The Left was attacked by General LANNES and General LANUS(Lanusse), supported the vanguard. The enemy’s wings were separated by a fine plain, nearly half a mile in extent, and the cavalry having penetrated into it, attacked with rapidity the rear of the right and left wings, which were both cut off from all communications with the second line. The enemies threw themselves into the sea, in order to escape to their vessels, which were at the distance of three fourths of a league. They were all drowned, and presented the most horrible fight I have beheld. We then attacked the second line, which occupied a formidable position, with an intersected village in front, a redoubt in the centre, and entrenchments that were carried on in a line to the sea. It was also flanked by more than 30 gun boats. General FUGIERES advanced in a compact column against the right of the enemy, and the assault and defence were vigorously maintained. 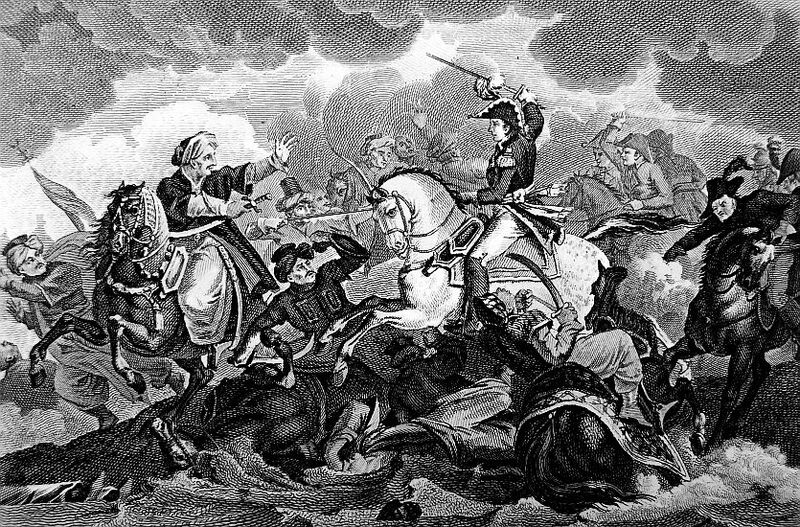 The victory was again decided by the cavalry, who charged the enemy rapidly in the rear, and made a dreadful carnage. BERNARD, Chief of the 69th Battalion, and Citizen BABYLE, Captain of Grenadiers of that Brigade, have acquired the greatest glory. The redoubt was taken, and the hussars having again placed themselves between the fortress of Aboukir and the second line, the enemies, pursued by our cavalry, were obliged to precipitate themselves into the water, and were drowned. We next proceeded to invest the fortress in which the reserve was posted, but unwilling to lose any of our men, I ordered 6 mortars to be placed for the purpose of bombarding it. The shore on which the currents drove last year the dead bodies of the French and English, is now covered with those of the enemy. More than 6000 of them have been already counted. Three thousand were buried on the field of battle. Not a single man of the army shall have escaped when the fortress shall surrender, which must soon happen. Two hundred standards, all the baggage, the tents, 40 pieces of field artillery, KUFFE MUSTAPHA, Pacha of Natolia, and cousin German of the Turkish Ambassador at Paris, who commanded the expedition, taken prisoner, with all his officers, are the fruits of our victory. We have had 100 men killed, and 500 wounded; among the former is Adjutant-General LETURE, DUVIVIER and CRETIN, Chiefs of Brigade, and GUILBERT, my Aide-de-Camp. The two first were excellent officers of cavalry, of the most intrepid bravery, whom the chance of war had for a long time respected. The third was an officer of engineers, who was the completest master of that difficult art, in which the slightest mistakes have so much influence on the event of campaigns and the destiny of States, I have ever known. My friendship for the last was considerable. 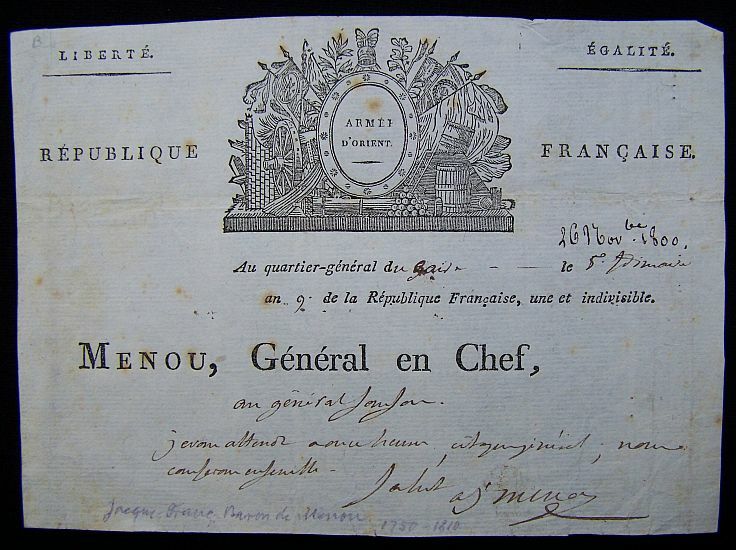 MENOU, Provisional General in Chief to Citizen BONAPARTE, First Consul of the French Republic. A horrible event which has few examples in the annals of history has raised me to the provisional command of the Army of the East. 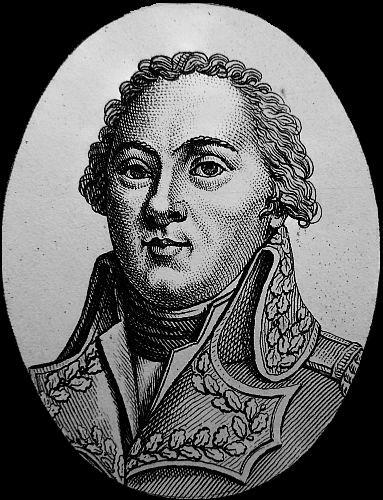 General KLEBER was assassinated the 14th of June last. A wretch dispatches from Gaza about 48 days ago, by the Aga of the Janissaries of the Ottoman Army, pierced with for thrusts of a poniard the General in Chief, at the moment when he was walking with Citizen PROTAIN, the Architect, upon the terrace, which, from the garden of the head-quarters commands a view of the place Ezbekier. Citizen PROTAIN, in attempting to defend the General, was himself pierced with six strokes of a poniard. The first blow which KLEBER received was mortal. He has fallen. PROTAIN is still alive. The General, who was giving orders for the repair of the head-quarters, and of the garden, had with him no Aide-de-Camp. none of the corps of guides. It was his wish to be alone. He was found expiring. The assassin, discovered under a heap of rubbish, and brought to the head-quarters, acknowledged that he had been solicited to commit this crime by the Aga of the Janissaries of the Ottoman Army, commanded by the Grand Vizier in person. The Vizier, unable to conquer the French fairly in arms, employed for his revenge the dagger, the weapon of cowards. The assassin called himself SOULEYMAN EL ALEPI. He came from Aleppo; arrived at Cairo after having crossed the desart on a dromedary, he lodged at the Grand Mosque Eleazar, from which he came out daily, to watch an opportunity to commit the crime. He confided his secret to four subordinate Chieks of the law, who fought to divert him from his purpose, but who, not having informed against him, have been arrested in consequence of the depositions of the assassin, condemned to death, and executed the 17th of last month. The Commission proceeded with the utmost solemnity in the conduct of the trail, thought it incumbent on them to follow the Egyptian Customs in applying the punishment. The assassin was condemned to be impaled, after his right hand had been first burned, and three of the culpable Chieks to be decapitated and the bodies given to the flames. The fourth not having been arrested, was adjudged guilty by contumacy. I annex, Citizen Consul, the sundry documents relating to the trail. I should now, Citizen Consul, communicate to you the almost incredible events which have taken place in Egypt; but I should apprize you that General KLEBER’S papers not being yet in order, I can only give you simply the dates of the circumstances. At a more favourable opportunity, I will transmit you all the details; but it is so necessary that you should be acquainted with our situation that I resolve to send you only a simple account. Head-quarters at Cairo, June 15. Soldiers, an atrocious crime has deprived you of a General whom you loved and respected. 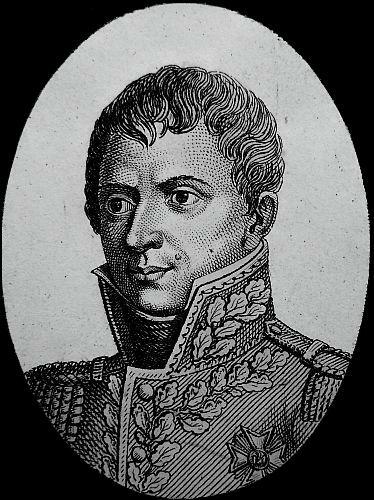 An enemy, deserving of the contempt and indignation of the whole world–an enemy incapable of vanquishing the French under the command of the brave KLEBER, has had the baseness to employ an assassin. I denounce to you, I denounce to the whole world, the GRAND VIZIER, the Commander of the army which you annihilated in the plains of Mathariek and Heliopolis. It is he who, in concert with his Aga of Janissaries, placed the dagger in the hands of one SOLEYMAN EL ALEPPI; who, having left Gaza thirty-two days ago, deprived us yesterday, by the blackest of crimes, of one whose memory should be dear to every Frenchman. Soldiers, KLEBER, marching at your head, dispersed that cloud of barbarians which burst upon Egypt from Europe and Aisa. KLEBER, at the head of your invincible bands, reconquered the whole of Egypt in ten days. KLEBER had so restored the military finances, that all arrears due to their pay regularly assured to them. KLEBER, by wise regulations, had reformed a great part of the abuses almost unavoidable in great administrations. The highest honours you can pay to the memory of the brave KLEBER, is to maintain that fierce and formidable attitude which strikes terror into your enemies wherever you move. It depends on you to restrict yourselves to that discipline which constitutes the strength of an army. It is for you to always remember that you are Republicans, and that at all times you should give example of morality and obedience to your Commanders, as you furnish the enemy with proofs of your courage and daring in battle. Soldiers, Seniority of rank gives me the temporary command of the army. I can only offer you an attachment that knows no bounds, to the Republic, the liberty, and prosperity of France. I will invoke the manes of KLEBER. I will call upon the genius of BONAPARTE, and marching in the midst of you, we will mutually exert ourselves for the interest of the Republic. The army shall be immediately acquainted with all the details of this execrable assassination, as well as the proceeding for the discovery and punishment of the assassin and his accomplices. FUNERAL OF GENERAL KLEBER, AT CAIRO. Five pieces of light artillery. The twenty-second demi-brigade of light infantry. The first regiment of cavalry. The different bands of music belonging to the garrison. Next was the body of General KLEBER, in a leaden coffin, deposited on a chariot of an elegant form, covered in black velvet, ornamented with silver, and surrounded with trophies and arms. On the top of it were the helmet and sword of the General, and the chariot was drawn by six horses in black and white plumage. General MENOU followed, attended by the Officers of Corps of Guides, and preceded by the Aides-de-Camp of General KLEBER. The whole finished with the corps of engineers, of artillery, the Commissaries of War, the Officers of Health, the different Administrations, the Agent of MURAT BEY, attended by his Mameluks; the Agas, the Cadis, the Shieks, the Cophts, the different brigades of the French Army, the Syrian and Mameluk horse, and a detachment of French cavalry. The Funeral oration was delivered by Citizen FOURIER, French Commissioner to the Divan, and the body was interred amid the discharges of cannon and artillery. Copy of a Certificate, given by the Adjutant General’s Directions to ANTHONY LUTZ, Private Soldier in the Regiment of Minorca or Stuart. I do hereby certify, that ANTHONY LUTZ, a private soldier in the regiment of Minorca or Stuart, did (on the 21st of March, 1801, during the action between the English and French armies commanded by Sir RALPH AMBERCROMBIE, and the French General in Chief MENOU, on the above day, within three miles of Alexandria) take FROM THE ENEMY a standard, which bore several marks of honourable distinction, such as the passage of the Piava and Tagliameno, when under BONAPARTE, in Italy, and in the centre which is a bugle horn within a wreath of laurel–I do also certify that the said ANTHONY LUTZ, brought the standard to the head-quarters of his Excellency Sir RALPH AMBERCROMBIE, where he delivered it into my hands, when he, at the same time, received from me, by order, a gratuity of 20 dollars, for so signal an instance of good conduct. And I do further certify, that I forwarded the standard, thus taken by the above ANTHONY LUTZ, to Sir RALPH AMBERCROMBIE, then ill of his wounds in his Majesty’s ship FOUDROYANT, that his Excellency received it accordingly, and that it is now in our possession. Given under my hand at the Adjutant General’s quarters, in camp before Alexandria, this 3d day of April, 1801. Site and Documents © copyright 2007-2019 Barry Winningham. All rights reserved.